EA Sports made some new additions for NCAA Football 13, including playing as a new batch of past Heisman Trophy winners and a revamped passing game. Will those new features create new fans or has the once-fresh franchise grown stale? NCAA Football 13 follows a tried-but-true formula: Year after year, EA Sports sells the same product to the masses, but with minor tweaks. Stats are adjusted and new players are added, but generally, it’s always the same game. Because of this reason, people either love or loathe EA. 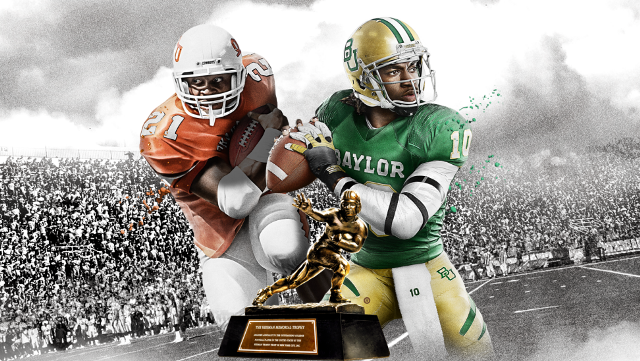 Gamers may choose to play alongside past Heisman Trophy winners Robert Griffin III, Andre Ware, Barry Sanders, Carson Palmer, Charlie Ward, Desmond Howard, Doug Flutie, Eddie George, Herschel Walker and Marcus Allen. It’s easier to play and win with Heisman Trophy-winning running backs and more difficult with the rest. Desmond Howard is the toughest of the bunch in attempting to win the Heisman trophy. Many gamers despise Electronic Arts for their impatience with online games. As soon as a game has been outdated, EA will quickly shut down their online servers, usually without notice. As a result, many gamers refuse to buy their sports games. Generally, the achievements are easy to get, but if one wants to max out all available achievements, he or she must do so quickly before EA shuts down the online servers. Sometimes, that’ll happen less than a year after a game’s release. After I purchased the game, EA revealed that all Online Passes would cease to exist on current-generation consoles. That will result in an across-the-board price drop and possibly win back some jaded fans. That gesture is just a toss in the bucket, though, because with all next-generation consoles (XBOX One, Playstation 4), each game will require online verification. Kind of like the pot calling the kettle black. NCAA Football 13 does offer an all-new passing game, but it isn’t as revolutionary as the game’s cover declares. It feels just as normal as previous years incarnations. As an achievement whore, I despise random and annoying achievements. EA Sports seem to pride themselves on ridiculously tough achievements, with each year’s product always having a few. The worst achievements in this game include Read and React and Don’t Run Home to Mamma, which both can be manipulated so the player can eventually get, but there’s far too much randomness involved for this to happen. The Road to Glory Mode was yet again, annoying, but that’s to be expected. The game is playable, but do expect to grind out a few tougher achievements. If you’re a sports fan and enjoy American football, this is a must buy. For everyone else, pick up a used copy. Strength: New, playable Heisman Winners added. Weakness: A couple of ridiculously tough and random achievements. WTF Moment: Reducing the size of your opposition and creating a seven-foot giant of a player still doesn’t guarantee success.